Outdoor lighting comes in all sorts of shapes and sizes. 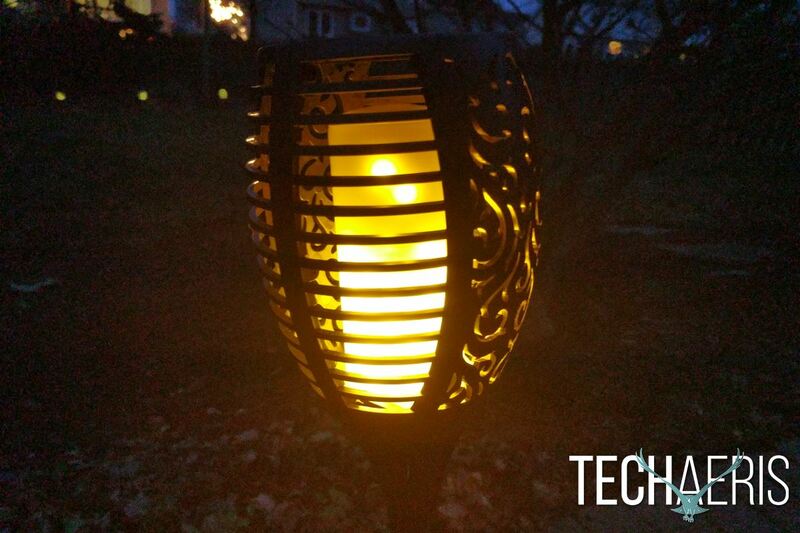 From the original tiki-style torch to small decorative solar lamps and everything in between. 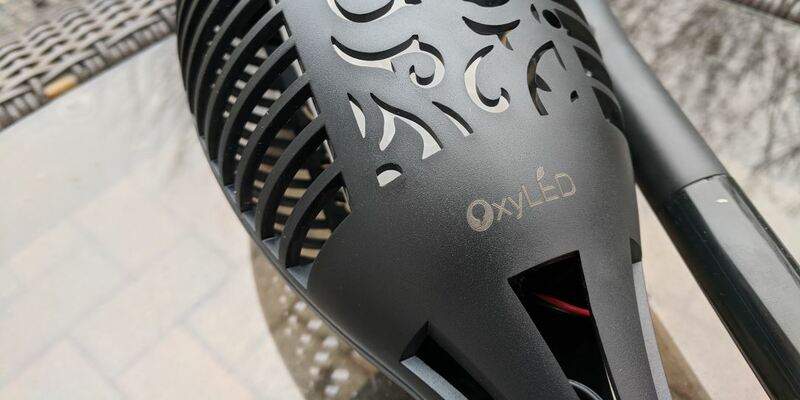 OxyLED has a wide variety of indoor and outdoor lighting solutions, and today we’ll be looking at an outdoor lighting set. 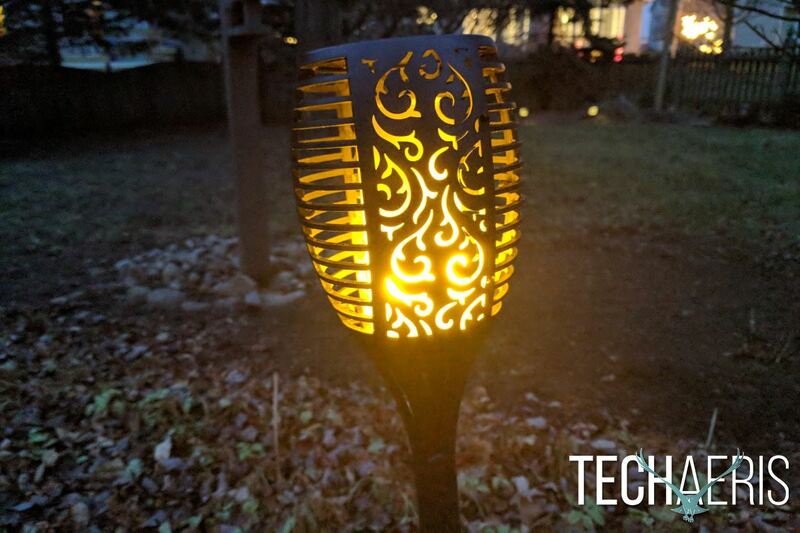 The OxyLED Solar Torch Light boasts realistic flame LED lighting, but does it deliver? 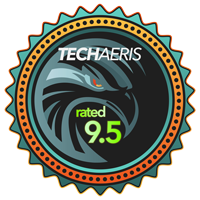 Keep reading to find out in this full review. The OxyLED Solar Torch Light does have a relatively torch-like appearance, which makes sense considering the name. Starting at the top, the bulbous “torch” is approximately 15” in circumference at its widest point, with a 3 ¾” diameter solar panel across the very top. 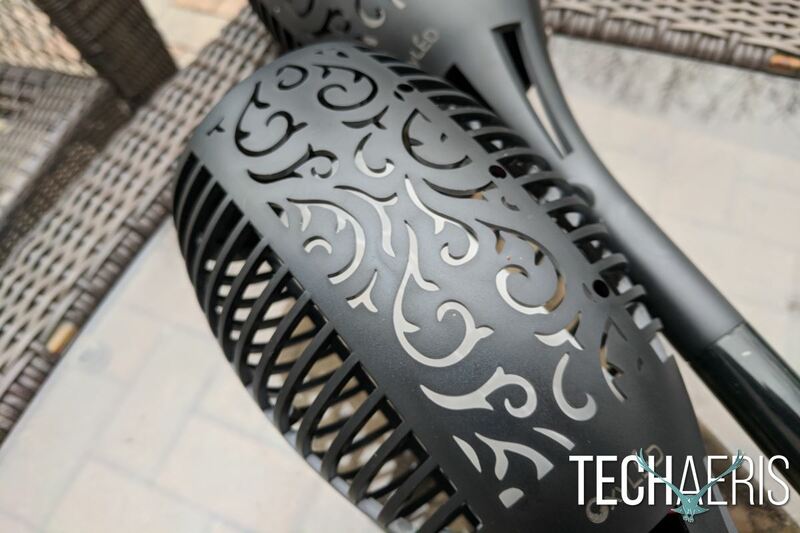 The torch curves outward, with a simple series of horizontal cutouts alternated with detailed decorative cutouts. The LED lighting element can be seen in the middle of the bulb, as a white tower bulb taking up most of the interior center of the bulb. The torch tapers down at the base, where it transitions into the post and spike that will be pushed into the ground. Just before the base of the torch portion, there’s an open area where some of the internal wiring can be seen running to the power button. While that shouldn’t be an issue, it might have been nice to see that wiring secured to the frame somehow. The aforementioned power button can be useful if you want to conserve battery power for later, or just don’t need the torches lit at that exact moment. The post and spike are attached by simply pushing one part into the other. Fully assembled, the torch stands at around 28” tall, making it a good size for most exterior applications. The body of the torch, as well as the post and spike, are all plastic, but everything feels solid, and the decorative cutouts add interest and flair to the overall design. After getting everything out of the box, you’ll first need to assemble the torches. As outlined above, that’s a very simple process and simply requires attaching the post to the base of the torch, and then adding the spike at the bottom. Once that’s done, push the torch into the ground where you want it to live. I’d recommend holding onto the post rather than the torch portion of the setup when pushing into the ground in order to avoid any damage to the torch area up at the top. 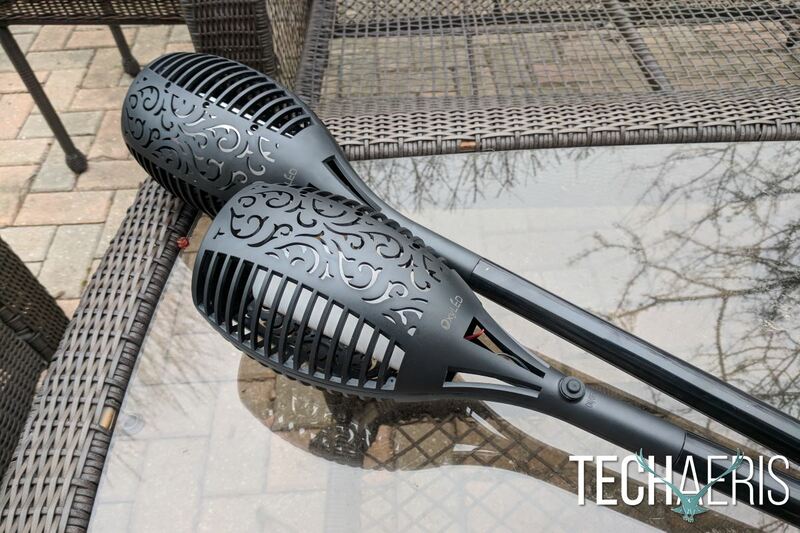 You’re going to want to put your torches in an area where they’ll be able to pick up sunlight during the day because there’s no battery power or any other means of powering these torches other than the sun. The good news is that the solar array on top is capable, and was able to get enough light to power the torches for a while even on overcast winter days, though of course they won’t get as much light and then, of course, won’t stay lit as long under those circumstances. Otherwise, just let the torches grab as much sunlight as they can, and enjoy once they turn on at around dusk. Once powered, the torches turn themselves on and off once conditions are light/dark enough. That means they’ll usually turn on just after dusk, though a porch light can trick them into turning off while the porch light is on, though that just lets them save a little bit of juice to stay powered longer once the extra light is turned off. 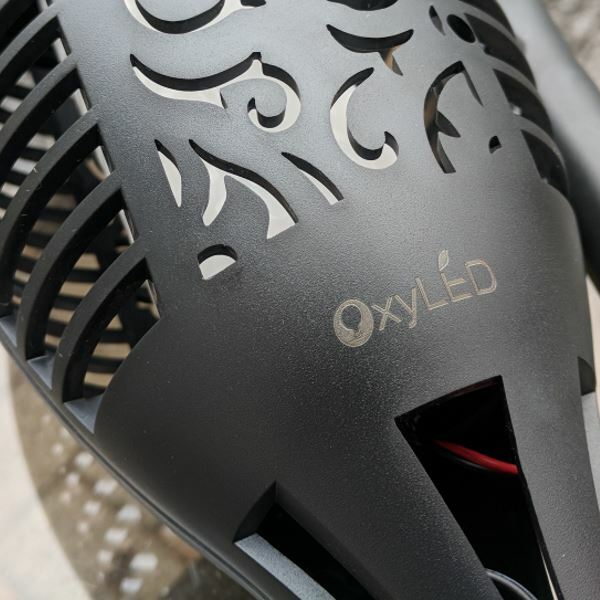 OxyLED claims that these torches have a realistic flickering flame appearance, and they really do. I was immediately impressed with how they look, and even knowing exactly what was going on, both my wife and I have had instances where we mistakenly thought something might have been on fire outside. 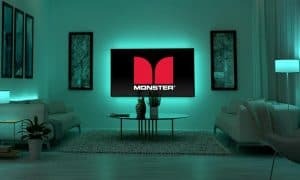 The realistic flickering looks really great. The animated gif below doesn’t really do the lighting justice, but it’ll give you an idea of what to expect. Under ideal circumstances, these torches will pick up enough solar energy to stay lit all night, though since we all know conditions won’t always be perfect, that mileage may vary. I personally saw really good results, even catching a glimpse of flickering “flames” outside of the window at 3-4am after the light had been on for around 8 hours. 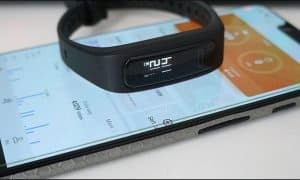 OxyLED suggests that the torch should run for 8-10 hours after a full charge, which should take 5-8 hours depending on conditions. In real-world use, there were maybe one or two days when the light didn’t stay lit until I was ready for bed. Those were usually days when it had been snowing and the solar panel was covered for part of the day. The torches had no problem with the weather though, just the lack of sunlight did cause them to stay lit for a shorter duration than normal. Most of the time they had no problem staying lit well into the wee hours of the morning, well after heading to bed. 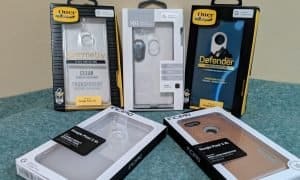 You can pick up a 2-pack of OxyLED Solar Torch lights for $29.99 USD, or a 4-pack for $54.99 USD on Amazon. For the price you’re getting a very nice looking torchlight with an impressively realistic flame LED light. If you want to add some new and interesting solar lighting to your yard, walkway, patio, or other outdoor areas, the OxyLED Solar Torch Light is a nice way to do so. They’re reasonably priced, look great, and can be a real conversation starter with their realistic LED flame lighting. *We were sent a review sample of the OxyLED Solar Torch Light for the purposes of this review. Some of the internal wiring is exposed inside of the frame near the base of the torch.